Countess de Clairefons: Raspeguy is a peasant. The army must resume its traditions. He should resign. Esclavier: You might as well tell him to shoot himself. In the tradition. Coming to Lost Command without any previous knowledge, I was expecting a garden variety war film, with bonding under fire, personal honor, yadda yadda yadda. While there's some of that here (enough, no doubt to satisfy the diehard fans of the war genre clichés), the picture also contains an unexpected depth. In particular, with historic hindsight, it seems to offer a prescient view of America's global military interventions since the time the film was produced. At the disastrous fall of Dien Bien Phu in 1954 Indochina, Lt. Col. Pierre Raspeguy (Anthony Quinn) holds his French troops together against brutal odds and through prison camp internment. Upon return to France on the armistice, he is relieved of command for failing to follow the orders of the inept General Melies (Jean Servais). But his romance with Countess de Clairefons (Michelle Morgan) and the reports of historian Capt. 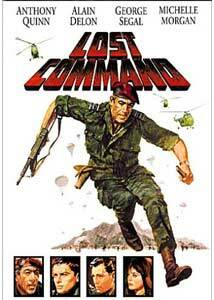 Esclavier (Alain Delon) get him a new command of a paratrooper regiment in Algeria. Once there, he finds himself under General Melies again, and must also face the devolution of his military tradition into being a tool of the local politicians. At the same time, he must come to terms with the fact one of his Indochina comrades, Lt. Mahidi (George Segal), is now the leader of the Algerian guerrillas fighting for independence. Whether it was intentional at the time or not, the picture provides a picture of the military in transition, from trench battles in foreign lands to guerrilla warfare and political intrigue against enemies that often seem invisible and untraceable. The ability of the Algerian rebels to blend into the countryside and any small hole in the desert should sound familiar after the often-frustrated American campaign in Afghanistan. The stresses apparent under such difficulties make the discipline of command unravel at the seams, as is exemplified by Captain Boisfeuras (Maurice Ronet). He is a charming and roguish fellow, but in duress he is capable of brutality, torture and even massacre. One wonders if the Rahlem massacre depicted here was all that different from the circumstances that provoked My Lai a few years later in Vietnam. This is pure speculation, but if this film had been required viewing at the Pentagon in 1966, things might have gone differently in Vietnam. The cast is adequate at best. Quinn basically does a one-note "tough guy with honor" routine. Never do we get an explanation as to why Raspeguy, a Basque peasant, is in the French military, or what motivates him. Segal is unrecognizable as Mahidi, but again his performance is fairly shallow; we don't see him struggle with his past with the men that he's killing, making one wonder why the point was made. Michelle Morgan is completely uninteresting, and the romance with Quinn is utterly perfunctory. It seems to be an "in the script" moment. Claudia Cardinale provides some sauciness as Mahidi's medical student sister-turned-prostitute under the chaos of the Algerian civil war, but she and Ronet seem to be the only members of the cast putting any effort at all into the proceedings. The battle sequences are well staged, but since they are mostly just anonymous extras getting gunned down they have little impact. Most of the style points come from the majestic score provided by maëstro Franz Waxman. As a result, this film gets the unusual ranking (for me anyway) of a substance score much higher than the style grade. Not particularly accomplished, it nonetheless touches on some important issues and manages to provoke thought about the role of the military in the post-WWII era. Image Transfer Review: The anamorphic widescreen presentation looks extremely good. There's plenty of detail, with even the dark day-for-night sequences being quite legible. Color is naturalistic without being oversaturated. In short, it looks appropriate for a movie mostly about desert warfare. Occasional speckling is the only notable defect on the source print. Audio Transfer Review: Although the audio is billed as Dolby Surround, there's practically nothing to be heard in the surrounds. The front soundstage is quite limited and suspiciously sounds like mono during most of the running time. Dialogue is clear and free of hiss and noise. Battle sounds are mediocre, without any chest-thumping bass as one has come to expect in modern films, but it was probably never there to begin with, so no points are lost on that score. Extras Review: The sole extras are an anamorphic widescreen trailer for the main film and a nonanamorphic 2.35:1 trailer for The Guns of Navarone. Both are in somewhat speckled but decent condition. Chaptering is the standard 28 chapters used by Columbia. Quinn and company rather stumble through the decline and fall of the French Empire, managing to anticipate many of the issues of the American military in the years since. Not particularly well done, Lost Command manages to satisfy the war buff as well as provide food for thought. The feature is supported by a nice new transfer, but little in the way of extras.